I explore the dynamic tension between the physical and emotional world. Printmaking processes can emphasize this struggle with layers of work. I also observe and interpret nature. I am a graphic and web designer with B.A. in Art from the UMBC, a masters in Publications Design, and a masters certificate in New Media Publishing from the University of Baltimore. 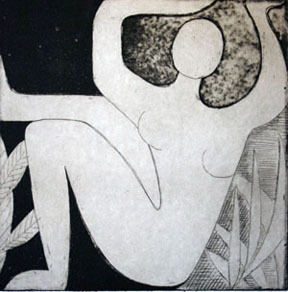 I enjoy printmaking and continue to take classes - there is always more to learn.